Thanks to Yamaha's groundbreaking DisklavierTV™, powered by RemoteLive™ technology, Elton's performance on the Yamaha Disklavier reproducing piano onstage with a 60-piece orchestra will be streamed live over the Internet and simultaneously to remote Disklaviers in many countries around the world, such as United States, Canada, United Kingdom, France, Germany, Russia, Japan, Korea, Malaysia, Australia and Singapore. His actual piano keystrokes are then faithfully recreated, note for note, in real time on each of the remote instruments, while the entire orchestra is seen and heard on adjacent monitors, in perfect sync with the remote piano performances. 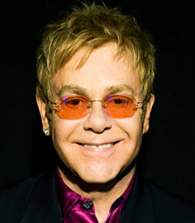 Your Disklavier piano will actually be played by Elton! With DisklavierTV, you have access to variety of streaming performances 24 hours a day, 7 days a week. For the detail, please visit DisklavierTV website. elsewhere in the world with added dimension of YOUR piano in YOUR home. Copyright © 2013 Yamaha Corporation of America and Yamaha Corporation. All rights reserved.